Laundry symbols can be pretty confusing - they're almost like another language in themselves! And if you want to avoid laundry mishaps, it's a language you should get clued up on. Whilst putting a cotton top in at 40ºC instead of 30 might not be a big deal, wools and silks are a different story. Today we're talking you through the mystery of washing labels so you can avoid ever ruining your clothes again. 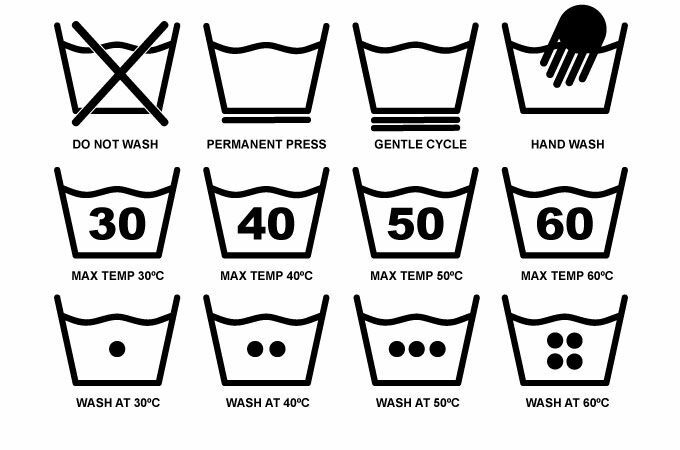 As well as explaining each mysterious symbol individually, we also have a washing label guide for you to print out and keep so you'll always have knowledge on hand. Ready to get washing? Then let's get started! This laundry symbol signifies washing. The symbol shown above indicated an instruction to do with the washing process itself. 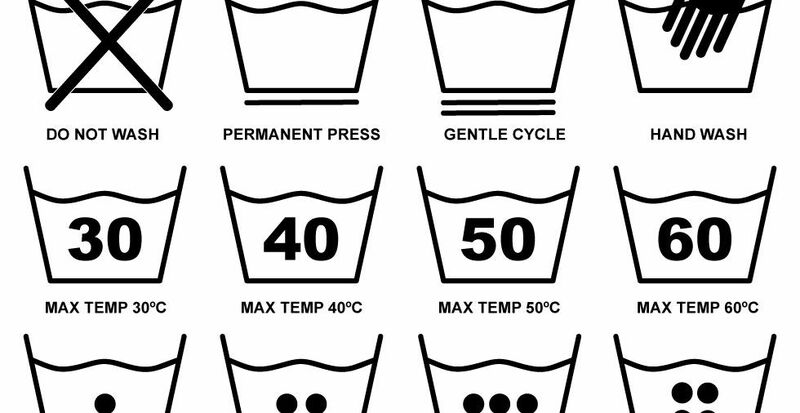 There are many variations of this symbol to give you more details on exactly how to wash your items for best results, including what temperature, method and cycle to use. Do not wash - Items with this symbol should not be washed at home. Instead, they will need to be dry cleaned - we'll discuss the corresponding symbols in detail later on. Permanent press - Permanent press items are those that have been treated to prevent wrinkles and any shape-distortion. They don't usually need to be ironed. Gentle cycle - Garments that require a gentle cycle are usually made from delicate fabrics such as wool or silk, or those that have details that could be damaged by a normal cycle. Hand wash - Clothes marked with a hand wash symbol should never be put in the washing machine. Instead, wash them by hand in a small basin with some special detergent (those intended for hand wash use are normally much milder). This laundry symbol signifies for tumble dry. The basic symbol for tumble drying is a square with a circle inside. There are variations to the symbol which tell you exactly how to dry your clothes and also what temperature to use to ensure they do not fade or worse, shrink, in the wash. 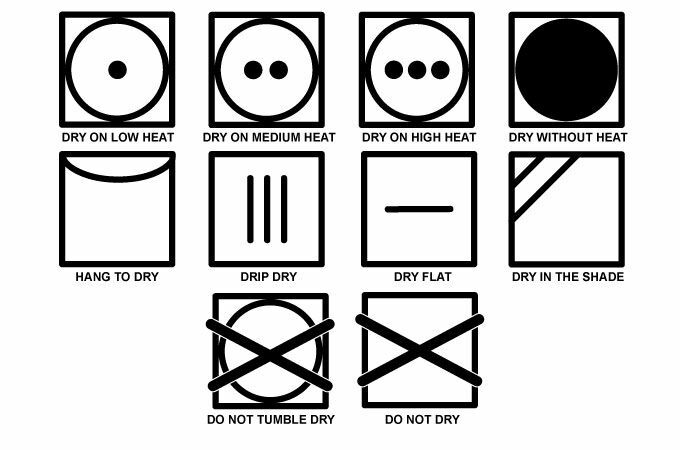 The laundry symbol of a square without the accompanying circle signifies drying without the use of a tumble dryer, and again, has several variations shown below. Drip dry -synthetic garments are usually ok to be hung up straight out of the wash, even when dripping wet. They usually dry without wrinkles when hung up to 'drip-dry' and therefore don't need ironing either. Hang to dry - items that are marked with the 'hang to dry' symbol can be popped over a drying rack or hung up to dry on hangers. Dry flat - garments that need to be dried flat are usually relatively heavy, and therefore shouldn't be hung in case the weight alters their shape. Place on flat surfaces or flat across drying racks to dry. Ever burnt a hole through a piece of clothing? Getting clued up on the different ironing symbols will ensure it never happens again. The symbol above stands for ironing and variations on it help you determine what temperature or setting to use. No steam - Some materials don't react well to steam, or to put it another way, the combination of water and heat. If you see this label, be sure to turn off the steam function on your iron before ironing. This symbol signifies dry cleaning. We've arrived - the dreaded dry clean only symbol! This one means your garment could be damaged in the wash and should be laundered professionally. It may be more expensive, but trust us, it's not worth risking. Letters - dry cleaning symbols with letters insides are there to tell the professionals how to treat the garment, so you don't need to pay too much attention to these. Keep an eye out for laundry symbols on all your clothes to prevent any mishaps! What's the worst washing accident you've ever had? Let us know in the comments below! Hi Steph - Years ago, when I had my very first washing machine, I accidently put my husband's beautiful cable-knit sweater on at 90. It came out so small that it fitted our daughter's teddybear! Of course, I had to buy him a new sweater. What a funny story! I bet the bear looked very fashionable. Thanks for getting in touch. That's a great story, Stephen! When I was first married I decided to boil some cotton hankies. Not a problem until I decided to put a yellow duster in as well to make sure it was germ free. All of our hankies turned a dirty yellow colour and it took months before I managed to get them white again. We're impressed that you managed to get them white again, Sylvia! Hi. My main problem is sorting clothes and worrying that some garments may run. We all seem to have so much more clothing nowadays so the washing machine is in constant use and there are so many different fabrics to deal with! I find using Colour Catchers reassures and makes things easier for me. Also I have a question: is it OK to wash trainers in the machine and at what temperature? Hi Dee! I love using Colour catchers too, even if just for peace of mind. You can wash trainers in the washing machine, but it can ruin them so be careful. Your best bet is to test the method on a cheap pair of trainers first. Start by removing the laces and scrubbing away any surface dirt. Remove the laces and then place the trainers inside of a pillowcase or a mesh bag. Put them in the washing machine along with a couple of towels. The towels will reduce noise and protect your shoes. I'd suggest washing on a hand wash setting or 30°C.